Why May-October is the Best Time for Diving in Tulamben? Looking for a new diving experience with affordable budget? Tulamben is a worth spot to try for those who are seeking for a wide variety of underwater beings and brand-new dive sites! It is a small fishing village on the north-east cost of Bali and famous internationally because of the USAT Liberty Shipwreck Cargo. Most of scuba divers consider this place as one of dive sites with the best beach access in the world. If you are wondering when to visit Tulamben, May until October is the perfect time to dive there because it is during the dry season. The winds are regularly weak and the seas tranquil at the time. The water temperature is also mild enough, around 26-30 degrees during this period. While the weather is most likely to be good with nice average temperatures, so it won’t be a concern. Somehow, visibility can be reduced and drop during the rainy season, so you can’t really see anything down there. Luckily, visibility is best during these months of dry season, and divers can see an increase in pelagic species. Even on good days the visibility can climaxing at 120 ft or 40 meters! From July until October, Tulamben, especially the wreck, is very crowded with divers. Make sure this won’t prevent you from a sunrise dive on the Liberty to have it all to yourself! 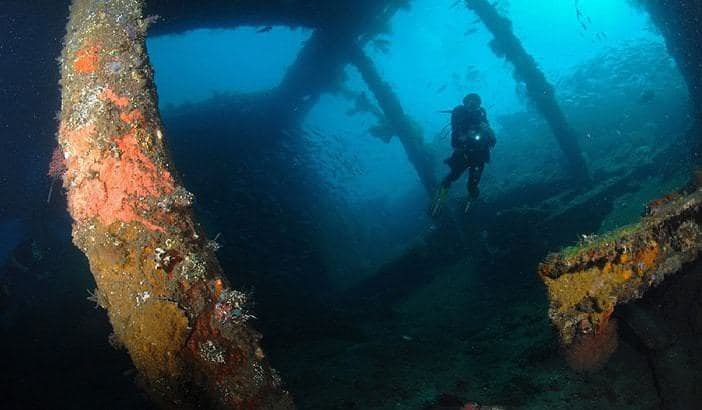 It is not only an amazing wreck dive, but it is also a truly living reef with its history. You should go diving earlier in the morning before 8 am, so it will be less crowded, and you can enjoy it better. What to see more other than the Liberty wreck? Coral Garden can be in you to-do-list, as it is suitable for beginners and experienced divers. It offers you to see rare corals and fish you can never find in other places. There will be leaf scorpion fish, ribbon moray eels, clown fish, even black tip sharks! The depth and location make it as a popular spot to do night dive and snorkeling. Located 300 meters from the Liberty Wreck and the average depth is 10 meters until 25 meters. Tulamben Tree House is a famous tree house in Tulamben which was established in 2015. The tree house is well known for the beautiful scenery, and always crowded of tourists. You can see the peak of Mount Agung, the highest volcano in Bali, if you’re facing to the southwest. While on the east, you can sightsee Amed beach and Tulamben beach. The opening hours is from 07.00-18.00 and the entrance fee is only Rp 10.000/person. Tirta Gangga shouldn’t be missed because it is a royal water garden built in 1946. It involves tropical gardens, wading pools, fish ponds, fountains, ornate statues, and stepping stones. The water in this place is measured holy by the society, and they use it for religious ceremonies. If you’re planning to go there, the place is open from 08.00-23.00.